They're the cars you've been asking us to make. This one's the GS455 equipped with the Stage 1 performance package. If it's performance you want, the GS455 Stage 1 has it. A 455 cubic-inch engine. With a high-lift cam and four barrel carburetor which breathes through real air-scoops to add performance. A cooling system that should never overheat. And four on the floor is available. Or an improved 3-speed automatic transmission. Maybe it's the name Buick, with all the goodness and confidence that goes with that name, that really gets you. Whatever it is, the GS455 Stage 1 has it. 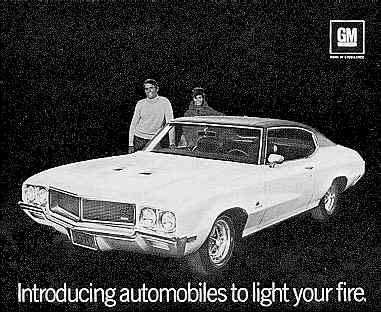 And so do all the Light Your Fire Cars from Buick 1970. See them.